Actually, I should say, “cold”. It’s a video of folks doing aikido outside in Norway — in the snow. Is everyone but the nage (the person doing the techniques) barefoot? Here’s the National Geographic Special about aikido. The show is about a woman’s trip to Japan to get a deeper understanding of budo — the way of the warrior. She had been training in aikido for about 25 years when she went to Japan. There’s really not that much aikido in this show. But there are some thing of interest that can make watching it worthwhile. She visits Iwama, the home of Saito Sensei, and learns some etiquette lessons. Saito Sensei is depicted as quite the taskmaster. Being a live-in student there (uchideshi) is portrayed as harsh. This is not at all the feeling at the dojos where I’ve trained, particularly Aikido’Ka. The woman visits Shingu, where Hikitsuchi Sensei (10th dan) taught. Hikitsuchi Sensei died in 2004. Anno Sensei is chief instructor there now, I believe. Jack Wada Sensei, Linda Holliday Sensei and Mary Heiny Sensei all trained there together. I will soon post an interview I did with Jack Wada Sensei. She also visits Hombu Dojo, the aikido’s worldwide headquarters. She meets and gets to train with Doshu, the founder’s grandson. Doshu is the leader of aikido worldwide. In this interview, I talk to the remarkable Mary Heiny Sensei. We talked at the June 2009 Aiki Retreat in Atherton, California. 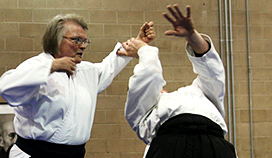 Heiny Sensei talks about her early years in aikido and the benefits of aikido. In particular, Heiny Sensei discusses how anyone can get the benefits of aikido, no matter your physical condition. Heiny Sensei has devoted her life to aikido since 1965 when she saw the founder of aikido — Morihei Ueshiba — teach a class. She lived in Japan from 1968 – 1973, studying at Hombu Dojo (aikido world headquarters in Tokyo) and with Hikitsuchi Sensei (10th dan black belt) in the town of Shingu. She has been teaching ever since. I was really thrilled to have the opportunity to speak with Heiny Sensei. I hope you enjoy the interview as much as I did. The photo is by Alex Kolbasov. You can see more of Alex’s photos of Mary Sensei at the Atherton Retreat here. Congratulations on an Amazing Job! 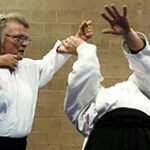 As you may know, when I was at the Aiki Retreat last month, I recorded several interviews with senior aikido teachers. Here’s the link to my first interview, with Michael Friedl Sensei. This interview is with Danielle Smith Sensei. Smith Sensei is a 6th degree black belt and chief instructor of Aikido of Monterey. Smith Sensei is a certified Pilates instructor, 3rd black belt in Hakko Ryu Jujutsu, a 4th degree black belt in Seibukan Jujutsu and a 1st degree black belt in Iaido. To top it all off, Smith Sensei is President of the California Aikido Association, of which Aikido’Ka is a member. Smith Sensei discusses her early years in aikido, what new aikidoists can expect to experience, aikido and conflict, aikido training with physical challenges and why she continues training and teaching. Smith Sensei is an absolutely delightful person to train with and to know. If you ever get the chance to visit her dojo in Monterey, don’t miss it!